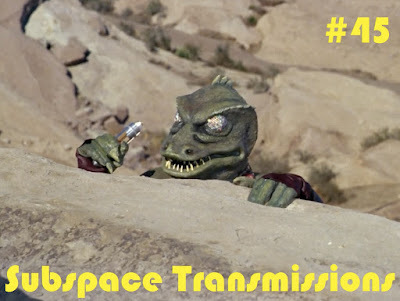 Subspace Transmissions: A Star Trek Podcast: EPISODE 45 - "BEST ONE-OFF CHARACTERS"
Thanks to its episodic format, Star Trek has offered up a veritable smorgasbord of unforgettable single episode guest characters over its lengthy run. But who, among the countless, rank the highest? This week hosts Cam Smith and Tyler Orton dig through the hundreds of contenders to call out their favorite one-and-done greats. Want a taste of who made their lists? How about a few high profile Romulans, a certain scaly arena denizen and a New Jersey jackass con-man? If you want to hear specifics, as well as some fun surprises and bizarre tangents, you'll have to download away! Enjoy! Wanna appear on the show? Shoot us a 30 to 60-second audio clip letting us know who you think Trek's BEST ONE-OFF CHARACTERS are and you could take the spotlight in an upcoming program! You can also send any other questions, topic ideas or feedback to subspacetransmissionspod@gmail.com!